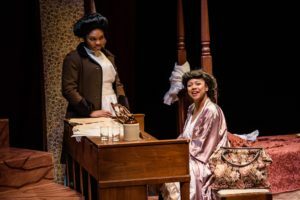 The New York based play Intimate Apparel took the stage at Kent State’s Center for the Performing Arts this past week. The early 1900s play featured a seamstress named Ester who sews beautiful lingerie and lives a quiet life dedicated to her craft, dreaming of owning her own beauty parlor one day. The storyline of finding a future in the arts also offered real life opportunity to the talented at Kent State. A Magazine sat down with the costume designer of the show to get an inside look on the creative process of putting on a play. Desiree Anderson is a senior graduating this winter with a theaters study BFA and a concentration in costume design. Anderson shared the process of getting the actors of Intimate Apparel dressed for their onstage performance. Q: Was there a message you were trying to portray through the costumes? A: The story is about an African American seamstress, and you can understand throughout the story how she feels about the fabric she touches. As an African American seamstress myself, I would go fabric swatching and look to see how Ester would feel about it and how I felt about it. I was able to put myself in the main character’s shoes, which was really interesting because that doesn’t always happen. Q: Was it a collaborative process or solely you? A: In theatre, everything is a collaboration. I started in May while I was in Santa Fe, New Mexico. I skyped and emailed the director and we decided on how we wanted to go with the direction: if we wanted to keep in in the same era, change it, how close to the script we wanted to be or was it freeform. We then broke down each scene to figure out what we thought would best work, and then I drew some sketches of what I thought each character would wear. Once school started, I then talked to the scene designer, the props master –– in the scenes, costumes are also used as props. We had to work altogether to make sure everything looked very cohesive. Q: Are all of the costumes hand-made or are they store bought? A: Some of it is store bought, pulled from our stock room, and then others were built. All the corsets in this play were built because we thought they were a very important aspect that needed to be built, especially because in the scenes they are labeled certain things. So, I wanted to make sure they stayed exactly how it was in the particular scene. Q: Was there anything that you struggled with during the process? A: It was difficult maintaining the image the director wanted, so I had to make sure I stayed with the script, but not losing my own ideas. I wanted to make sure that my ideas were also put into the effect, but also following what was in the script. Q: Was there a character that you thought had the best costumes? A: My favorite ensemble that I helped develop was the wedding dress. I worked closely with our draper to recreate a picture that I found. I went and found the fabric, and she was able to portray what I wanted.